According to oral tradition, the Yukon First Nation peoples have lived in this land since Crow, a mythological creature of the time, made the world and set it in order. Archeologists calculate that the first humans inhabited the Yukon more than 10,000 years ago, crossing the Bering land bridge, from Asia. 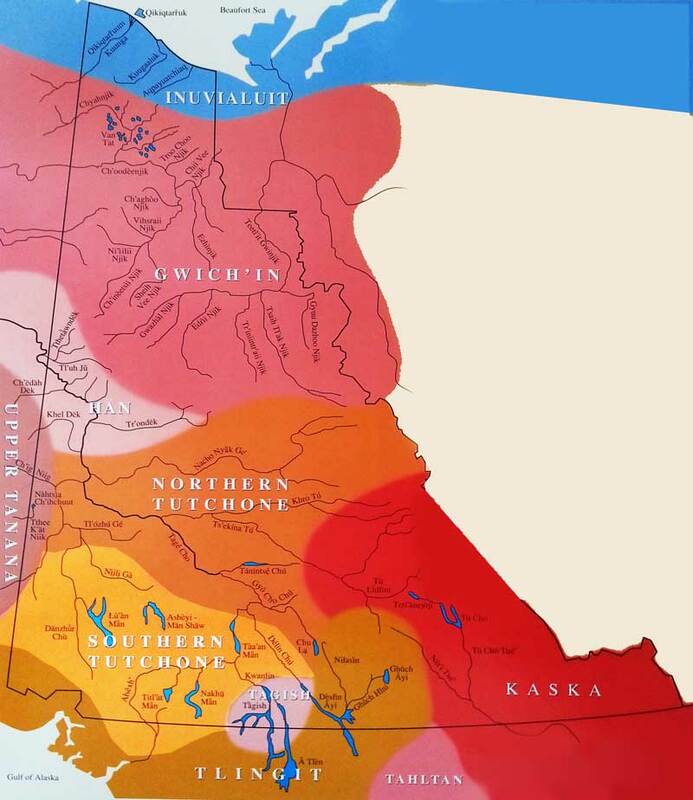 Today, the First Nations peoples belong to the Athapaskan or Tlingit language families. The Gwich’in people are our most northerly group in the Yukon. They inhabit a huge area of land in which there are four different dialects. Most familiar to Yukoners their are the Vuntut Gwitchin who reside in Old Crow, then there are the Tetlit Gwitchin in the Northwest Territories, the Tukudh Gwitchin in the Blackstone area, and the Alaskan Gwitchin. The Vuntut Gwitchin First Nation is the modern day political organization of the Yukon Gwitchin. The Vuntut Gwitchin signed their Yukon First Nation Final Agreement in May of 1993. The people live along the Porcupine River and follow annual cycles of subsistence. Right at the centre of life is the Porcupine Caribou Herd. The Hän are the people who live where the Yukon and Klondike Rivers merge. They lived through the greatest impact of change when the Klondike Gold Rush marked their lives with great social upheaval and displacement. Back during the Goldrush the Hän people in the Dawson City area, who are also referred to as the Tr’ondek Hwech’in, were relocated from their traditional village site at the mouth of the Klondike River to a mile down river where Moosehide is located. At the turn of the century, Chief Isaac foresaw great disruption of his people, so he took some songs and the dance stick to a Potlatch in Mansfield, Alaska. Here he entrusted the people to hold on to these songs until such a time when the Tr’ondek Hwech’in were able to relearn and bring the dance stick, known as the Gunhawk, back to the their homeland. Today the people are in the process of learning these songs once again. The Upper Tanana people live right next to the Yukon/Alaska border and ensure that their connections to relatives across the border remain strong. There are also Northern Tutchone people living in this area. The original village sites were at Snag and Scotty Creek, not at modern day Beaver Creek where the White River First Nation is based today. After the building of the Alaska Highway in 1942 by the Americans to provide a route from Alaska to the United States, many Yukon First Nations were relocated to new towns and villages along the highway. The Northern Tutchone inhabit the centre of the Yukon, often referred to as the ‘heart’. There are three modern day political organizations that make up the Northern Tutchone Tribal Council; The First Nation of Na-cho N’yak Dun, Selkirk First Nation, and the Little Salmon/Carmacks First Nation. All have signed their First Nation Final Agreements and are now self-governing. Selkirk First Nation is located in Pelly Crossing; however, this is not the original village site. The small villages of Fort Selkirk and Minto were home to the people of this area prior to the building of the Klondike Highway in the 1950’s. The Southern Tutchone occupy the areas of the southwest Yukon. Many traditional areas and village sites were once the centre of an actively nomadic and trading group of people. While many of these locations were gradually abandoned with the building of the Alaska Highway, they are still regarded with reverence as the homelands of the Southern Tutchone people. The modern day political organizations are Champagne and Aishihik First Nation in Haines Junction, Kluane First Nation in Burwash Landing, the Ta ‘an Kwach’ an Council in Lake Laberge and finally, Kwanlin Dun First Nation, which is located in Whitehorse. Kwanlin Dun is not affiliated with the Council of Yukon First Nations. The Kluane First Nation signed their self-government agreement in 2003 while the Champagne and Aishihik First Nation signed their self-government agreement in 1993. Today they are busy implementing the agreements while creating vibrant governments. The Tagish occupy the southern Lakes region of the Yukon, their language is an Athapaskan dialect, however, their culture over the last 300 years or so has merged with the Tlingit culture, creating a unique situation where many of people in this area are of both ancestries. The original village site is in Tagish while the town of Carcross was a hunting area where the people hunted caribou before White Pass Railways came to be in the late 1800s. The Tagish were known as the middlemen between the Interior Athapaskans and the Coastal Tlingits of Southeast Alaska. The partnership of the Yukon people and the coastal people has been one of cooperation. The modern day political organization is the Carcross/Tagish First Nation. The Inland Tlingit inhabit the area in the Southern Yukon based on the Teslin Lake and the Nisutlin River. They originate in Southeast Alaska and migrated into the interior via the Taku River to Atlin, then overland to Teslin. Initially, the Tlingit ventured into the Yukon for trade, which they were heavily involved in with all the Athapaskans along the southwestern Yukon areas. They went as far as Fort Selkirk in Northern Tutchone country. The Tlingit brought with them their social organizational systems, their songs, their dances and other important cultural factors. The modern day Inland Tlingit set up the Teslin Tlingit Council and have been self-governing since 1993.